It’s not just storing your digital assets, it’s all about the process of managing the life-cycle of your creative content. 1. What does DAM mean? DAM is an acronym for Digital Asset Management. A DAM software platform allows your team manage the life-cycle of a digital asset from creative development and classification to rights usage and finally distribution. A digital file includes everything from documents, images, audio files, logos, videos, drawings, Photoshop, Illustrator, InDesign, html files and even icons. A digital asset management software platform is not just about online file storage but, rather, the management, access and overall of files over time. 2. What should my DAM be able to do? Your DAM platform of choice should be capable of ingesting, securing, storing, enriching and publishing your digital assets. It should help your company manage workflow, of course, it should provide a lightening fast search – so your files are easy to find. So…what does this actually mean? Your digital asset management software should be capable of inputting digital assets of all types, not just documents or .jpegs, but all sorts of files, everything from video (MP4, WAV, etc) audio (MP3), Adobe files such as InDesign, Photoshop and Illustrators, .html files to PowerPoint Presentations, and certainly those file types that are relevant to your day-to-day content marketing requirements..
Obviously your Digital Asset Management software should be secure when it comes to overall access, however, it should also be capable of adding permissions as to which individuals or groups can access which files. Your DAM software platform will, of course, store your digital assets in various file formats, but it must also be able to store associated metadata. More importantly, you should be able to edit that metadata and customise keywords so they don’t simply describe the content of the file, but they should also represent. Enriching your assets – and your DAM experience: A truly worthy DAM platform will be capable of enriching and transforming assets that it ingests. This extends to more than just the ability to create thumbnails or proxy files. Your DAM platform should be able to add value to any asset it stores such as metadata management and file transformation. This could be through functionality that allows the addition of metadata or the ability to download files in different sizes and formats. Whatever the function, all these modifications and improvements to files should be trackable and stored with the individual file and each of its versions. To improve your DAM software experience, especially when working remotely or on a tablet or mobile, your DAM should offer the ability to preview files without having to download the full file. The beauty of a well-built Digital Asset Management platform is that it will allow your team to collaborate (regardless of their geographic location) and distribute assets within a pre-determined workflow approval process. Workflow functionality helps organisations collaborate when creating digital files, ensures creative materials are approved prior to going into the DAM, and before downloading certain images, an approval process can be triggered. One of the key features your DAM should possess is the ability to find required assets, but search functionality should go well beyond a mere search for the title of a file. Your DAM platform should be able to find assets based on other factors such as file metadata and metadata you add to a file as it relates to your business. More information on metadata taxonomies is available on IntelligenceBank Marketing’s Blog. The DAM you are considering should aid users in sharing and publishing assets quickly and easily. Be it the simple ability to embed assets into another website, instantly publish to social media outlets or to share collections of assets with third parties – great Digital Asset Management Platforms should make publishing and sharing easy. Enriching your assets – and your DAM experience: A truly worthy DAM platform will be capable of enriching and transforming assets that it ingests. This extends to more than just the ability to create thumbnails or proxy files. Your DAM platform should be able to add value to any asset it stores such as metadata management and file transformation. This could be through functionality that allows the addition of metadata or the ability to download files in different sizes and formats. Whatever the function, all these modifications and improvements to files should be trackable and stored with the individual file and each of its versions. To improve your DAM software experience, especially when working remotely or on a tablet or mobile, your DAM should offer the ability to preview files without having to download the full file. 3. It sounds simple enough. Why do I need a DAM ‘platform’? Why can’t I just use Dropbox or Google Drive? If you want your shared drive online – a file sync and sharing system such as Dropbox or Google Drive is suitable. However, if you are serious about managing your marketing content – and you want to manage your assets instead of simply sharing them – then a DAM is for you. DAM platforms take your ability to store and share digital assets to a whole other level by adding various layers of organization and protection to your files. For example, a DAM system not only allows you to store and share your files, it also allows the added functionality of being able to track versions of files; monitoring usage rights on those files; automatically extract and input metadata, add annotations and can even provide workflow options that allow you to create processes around the use of various files within an organization. At the end of these processes, your DAM will aid you in sharing and/or publishing these assets without requiring large files to be emailed around or uploaded via FTP. Free cloud storage solutions (or even their paid-for pro upgrades) simply don’t do that. 4. OK, so I get what a Digital Asset Management system is – what are the REAL benefits? To put it simply, a DAM platform makes your digital life easy. It removes the administration pain we all suffer from having to track too many files across multiple media channels, usage parameters, and end users. Just think about your shared drive – not a pretty picture. Given how expensive digital assets are to produce, organisations need to get the most out of them but if you can’t find them when you need them, what’s the point? DAM solutions are about cataloging and managing your media – anytime and from anywhere. You’ll be able to find any file you need quickly and easily, and you’ll also be able to control who can access and use those files, all the while knowing exactly about usage rights and talent expiration. DAM platforms make monitoring the usage of your digital assets a sync because they do all the tracking and monitoring for you. You can see which people in your company are using specific assets, and equally importantly, you can instantly see if creative is being overused. By having your digital assets properly categorised and centralised in on place, creative teams no longer have to spend hours creating – and recreating – assets for all your media channels. With a DAM, previous versions are readily available, and you can also download files in different sizes and formats on the fly – which ultimately, saves everyone time – and your business money. DAM platforms such as IntelligenceBank are pro-active and will even send you emails when such crucial dates are approaching so, even if you don’t check your DAM calendar, the system will alert you. Similarly, you won’t find yourself re-purchasing assets you already own – just because you can’t find them when they’re needed! If all that doesn’t convince you, why not calculate the potential savings yourself with our DAM ROI calculator. 5. So, who can use a DAM platform? Anyone who needs to store, organise, share and retrieve digital assets, really. Digital Asset Management platforms are basically for any business who takes their content marketing seriously. While many DAM platforms only cater to large organisations with big budgets, there are several companies, who also offer pricing for organisations with only 1-5 users and a variety of data storage requirements. In a corporate environment with multiple internal and external stakeholders, DAM platforms usually have extensive permission settings, so end users can easily access files that only matter to their part of the business. a) Administrators: Administrators create permission groups, add users to the system and determine general settings such as security parameters and branding. This allows users to email file links to non-registered users, enabling the capability to share files on social media and embed on third-party websites, set up workflows, create a universal taxonomy and metadata settings. b) Publishers: Publishers are able to add folders and content to the system, add new versions and approve which types of content can be added if a publish workflow is enabled. c) Access – Internal Users: Internal users are able to preview files online and download files in different formats and sizes, but cannot add or delete files. d) External/Ad-Hoc Users: These users can receive links to files, or can self-register to see a limited view of your asset library. As an added safety measure, you can require these users request permission before downloading specific asset. 6. 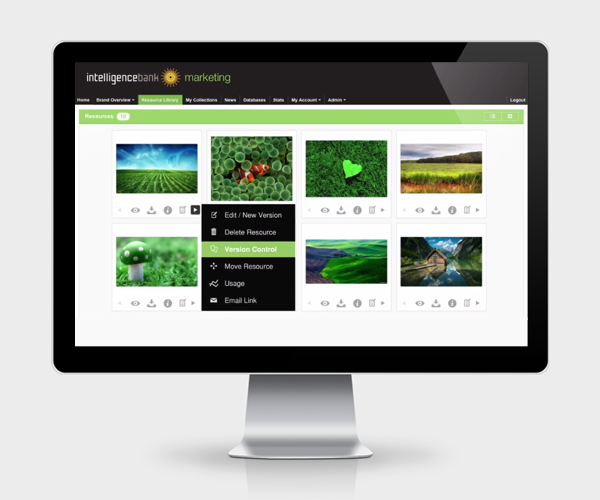 Is a Digital Asset Management system only for marketing departments? A DAM Platform may be the tools of marketing departments in organisations and government departments, but they are capable of delivering the same benefits and efficiencies to any department or organisation in any industry that handles digital assets en mass and, let’s face it, that’s just about any industry in the world right now. After all, though DAM platforms such as IntelligenceBank allow marketing departments to custom brand their DAM setups and share with users within an organisation in-depth brand guidelines, they could also just as easily help an architectural firm keep track of versions of its designs for multiple projects, or a FMCG company keep track of product packaging information. What about your sales department or distributors? Both need to be on top of your brand guidelines and brand assets/sales will, likely, need 24/7 access to core sales materials and current presentations, while distributors across the country or globe will require unfettered access to the latest approved assets and ONLY the latest approved assets. DAMs give all areas of a business in any industry this functionality, not just your marketing department. 7. What should I think about before I select a DAM partner? a) Is it user friendly? Each DAM platform sits along a spectrum. They can either be very technical and production oriented (i.e. designers and producers love them but the rest of the company struggles because they are too complex) – or they are operationally friendly (i.e. they lack some of the advanced bells and whistles – but everyone in your company can use it). Before you shortlist any vendors you need to ask them where on this spectrum they sit. b) Where are the files hosted – not just in the cloud – but specifically in which country? Some DAM’s offer self-hosted platforms, others are cloud based. If you opt for a cloud solution, finding out where the data is stored – specifically in which countries – and ensuring there is local access – is very important, especially when you are managing large files and video. Purchasing the software is just the start of your DAM journey. You need to work with a vendor who can help you with implementation, data migration, taxonomy structure and change management – and with one for whom customer service is important. By working with a DAM vendor who is experienced in these areas your implementation risk decreases dramatically. The last thing you want is an IT project that never gets off the ground and, with the right support services, your launch will be successful and you will be able to demonstrate an instant ROI. d) Can it help me with my processes? A DAM is not a shared drive online but rather a system that will save you time and money by automating your creative processes, collaboration during production, categorisation, distribution and talent and usage rights. Ensure your DAM offers robust workflow options so you can manage the end to end life-cycle of a creative asset. e) Can it interact with my other systems? A DAM should not be an island. Rather, it needs to be the very heart of your content marketing operation. Your DAM platform needs to offer robust APIs and Connectors, which will allow it to interact with other systems such as a CMS and even SharePoint. It should also offer connectors to your social media channels such as Twitter, Facebook, LinkedIn and Google Plus.